In today's jet-fuelled, caffeine-charged, celebrity-a-minute world, who actually has the time to watch a film from start to finish? Let's face it, life's too short. Now, Film in Five Seconds lets you fast-forward to the best bits so you can enjoy all your favourite movie moments in - literally - moments. Design studio H-57 have taken over 150 iconic films and cut away all the useless details, boiling them down into ingenious pictograms and creating hilarious visual snapshots that are witty, provocative and to the point. From Batman to Bridget Jones, Grease to The Godfather, King Kong to The King's Speech, via slapstick, sci-fi and superheroes, you'll laugh out loud as you identify some of the greatest screen moments of all time. 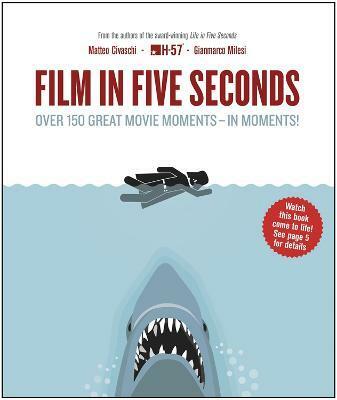 This is the perfect book for film buffs and anyone with a sense of humour or a short attention span.